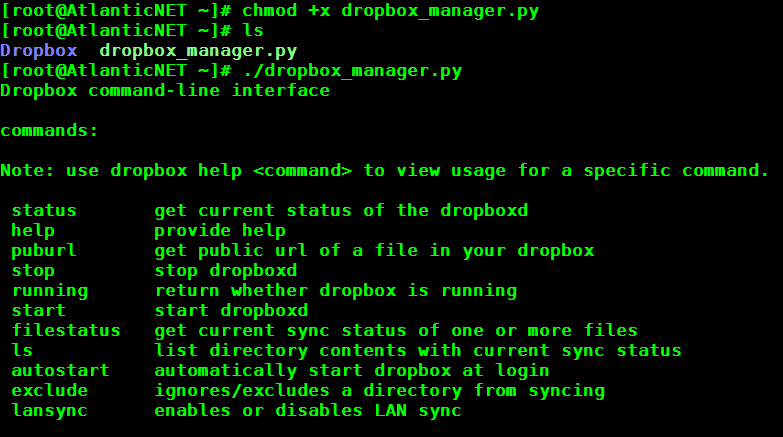 In this article, we will go over how to set up Dropbox via command line on a Linux Cloud Server. Dropbox is an excellent tool for making your files easy to share. -Any 32-bit or 64-bit Linux server. If you do not know if your system is 32-bit or 64-bit, follow our guide here, or if you need a secure and trusted Cloud server, consider one from Atlantic.Net. – You will also need a Dropbox account, which you can sign up for one here. The command cd ~ takes you to your login directory which it typically your home directory. If you run the ls -a command, you will see a newly created .dropbox-dist folder. Please visit https://YOUR-SPECIFIC-LINK to link this device. At this time, your files are being synced to the Dropbox folder that was created in the home folder of your current user. This can take a while, depending on how many files you have. That’s it! You can now check the status of your synced files and manage other aspects of Dropbox. Check back to learn more about hosting services from Atlantic.Net, including our HIPAA compliant database hosting.